A 3am channel-surfing escapade brought Darren Gaines to the movie The Ice Storm just as Sigorney Weaver reached her hand into the bowl and drew out the young man's keys. He bought a fish bowl the next day... wrote out instrument names, arrangements, recording ideas, names of toys and musicians, anything and everything that could inspire him... placed them all in the bowl and reached for his first draw... "No Drums." He smiled. 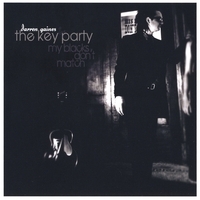 His Burroughs-esq technique spawned Hit or Miss, the debut album of The Key Party. Hit or Miss was named Album of the Day by CMJ, Download of the Week in the San Francisco Chronicle and praised as a "Tom Waits style one man junkyard army from New York" by the LA Weekly.